What is this all about? Our weather is changing, becoming less predictable with more frequent extreme events. Because of climate change, it will continue to change for decades to come. We will have to adapt, one way or another. Like everything in life, it is better to plan and prepare. Wise communities are keen to start discussions, increase understanding and help to create a Scotland that can adapt to the many challenges ahead. Everyone in Scotland is good at talking about the weather. 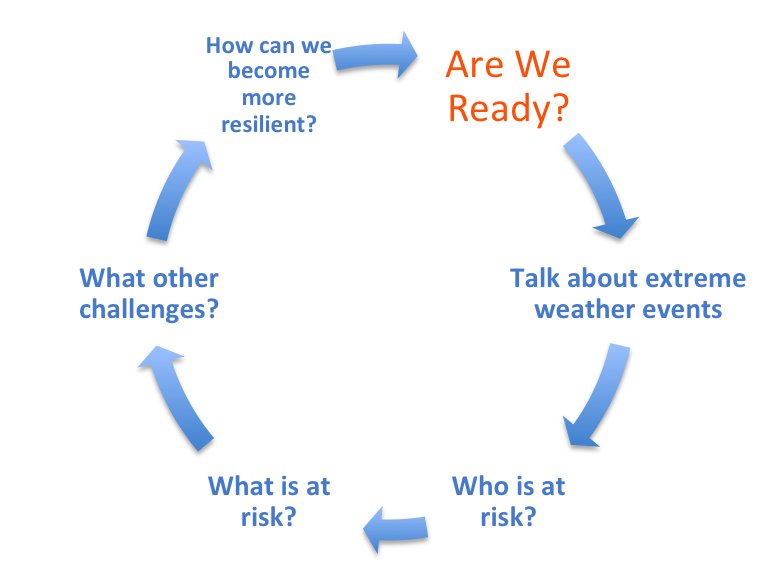 ‘Are We Ready?’ encourages us to talk about the weather as a starting point for discussing how to make our communities more resilient. 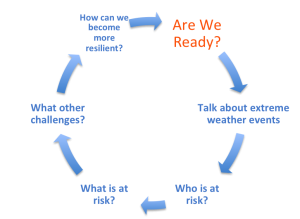 It is a resource for local people to use to start talking about the changing weather and the effect this and other challenges associated with climate change will have on our community. We hope this will start conversations in communities across Scotland. We want every community to get involved and to start planning for life beyond fossil fuels. Who is this for? It is for existing community groups/organisations interested in how to respond locally to changing weather patterns by planning and taking action to tackle climate change and increase community resilience. How to use this pack? We would like you to gather people together to watch our introductory film and use this to prompt conversation. You can use this to start conversations with others in your community. What good will this do? Starting a conversation will help you to involve others and build wider support in your community. You can use our film to start conversations with other groups such as your Community Council; Parents and Toddlers; schools and youth groups -for example. To run a workshop, download the Are-we-ready-facilitators-guide and the information sheets and then download the video here. Good luck! Please let us know how you get on (send an email to info@scottishcommunitiescan.org.uk). Are We Ready? from Sniffer Vimeo on Vimeo.